The 2007 the District commissioned Wilbur Smith and Associates to complete a mobility and transportation plan. The purpose of the plan was to address certain mobility and signage issues within the District. Ultimately the plan was to give the district a sense of identity through connectivity with sidewalk construction, green space improvements and signage projects. In 2010 many of the recommendations from the plan will be implemented. 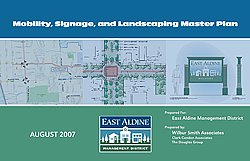 Click on the image to download a PDF of the plan.